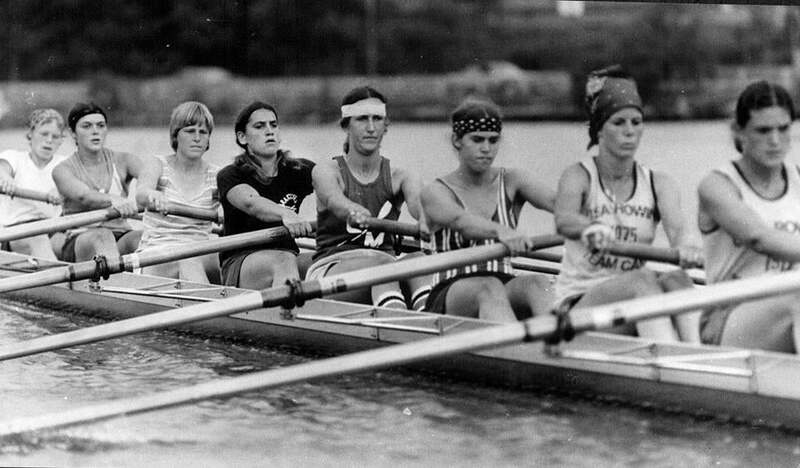 Chris Ernst (white jersey, rear) led a revolt by Yale rowers in 1976 that forced the university to implement changes in women’s athletics dictated by Title IX, which had been passed in 1972. The walk began from their locker room in the basement - where else would the women be? - and Chris Ernst remembers that the trudge up the flights of stairs was nearly silent. The women, all 19 of them, were angry, fed up, eager to take a stand, and Ernst carried their words in the handwritten script she clutched in her hand. Things were about to change at Yale, not just for these female rowers, but for all those who would follow in their wake. It was the afternoon of March 3, 1976, less than 48 months after Title IX was signed into law. Yale, which enrolled female students for the first time in 1969, had been slow to embrace the full message from Washington. The law of the land may have stated that female athletes were due equal rights on the playing field, but these women knew otherwise. They knew it in their bones, their frozen bones, chilled by the absence of working showers and warm water at the school’s boathouse in nearby Derby, Conn.
Too often, cloaked in sweat-drenched clothes after workouts, the women waited outside in the wintry cold while the men’s crew showered, a bus eventually arriving to shuttle both squads back to the New Haven campus. “Sweathogs,’’ some of Yale’s inconsiderate male rowers called them. The lack of showers would be remedied, school officials told the women for weeks on end, but for weeks on end they waited, shivered, steamed. So prior to practice on the afternoon of March 3, 19 of the nearly three dozen women on the crew made their way up those stairs at Payne Whitney Gymnasium and quietly filed into the office of Joni Barnett, the director of women’s athletics. With a photographer and reporter present, the women in unison shed their Yale sweatshirts and sweat pants, stripped naked in front of Barnett, covered only by the inscription “Title IX’’ that they had inked across one another’s backs and chests with blue felt-tip markers. The reporter, David Zweig, was executive editor of the Yale Daily News, but also a stringer for The New York Times. Fully aware of how the protest would play out, Zweig sat in a chair and faced a wall in Barnett’s office as the women peeled off their sweats. Nina Haight, the Yale Daily News photographer who accompanied Zweig, stationed herself atop a secretary’s desk and took the picture from behind Ernst. The photograph, which Ernst recalls ran in the Yale Daily News but not the Times, captured a bare-backed Ernst, with the words “Title IX’’ prominent, reading the statement in front of Barnett, the surprised administrator’s head tilted and eyes directed away from Ernst. The words worked, and quickly, with four showers immediately restored to working order in the trailer/makeshift locker room that was dormant for months next to the boathouse. The story’s placement in the Times, on the cover of the second section, proved a power sweep, triggering not only the fixing of the showers, but soon the hiring of Louise O’Neal to oversee sweeping changes in women’s athletics at Yale. “She did all the things that make athletics equal, and really made something change. Ernst will be honored June 27, when the Sports Museum and TD Garden stage “The Tradition,’’ the annual celebration on Causeway Street that recognizes the shakers and movers of New England Sports. The better-known likes of Pedro Martinez, Alexi Lalas, Jeremy Jacobs, Robert Parish, and Rodney Harrison will command most of the spotlight, but that’s an old story, set in motion long before Title IX began to change how we treat female athletes and how we view their accomplishments, great and small. The story of Ernst and the Yale women she represented that day may not be well-known, but it was powerful and it continues to influence the lives of amateur female athletes around the country. Born in Cambridge, the 58-year-old Ernst lived for a short while in Scituate and then spent sizable chunks of her pre-Yale years in the suburbs of Buffalo and later Chicago. After earning her undergraduate degree in English in 1976, she rowed that summer for the US in the Olympic Games, and then spent the next four years on Yale’s coaching staff, in charge of female novice rowers. In 1981, she was the first woman to become a union plumber in New Haven and eventually made her way to Boston in the late ’80s, ultimately to open her own shop some 20 years ago on Centre Street in Roslindale. Four of Pipelines’ five employees are female. There are many days, Ernst assured, when working a wrench is much like working an oar. “Oh, definitely, are you kidding me?’’ she said. “Sometimes you just have to say, ‘This is not working out well for me. I am going to be here a long time. I am not sure of the outcome and it could be physically ugly. Kevin Paul Dupont’s “On Second Thought’’ appears on Page 2 of the Sunday Globe Sports section. He can be reached at dupont@globe.com. Follow him on Twitter @GlobeKPD.